There is a growing and much-needed focus on identifying ‘impact pathways’ in agricultural research and development projects – the ways that causal links between research and its intended impacts can be identified. This includes identification of the partnerships needed to deliver on change. 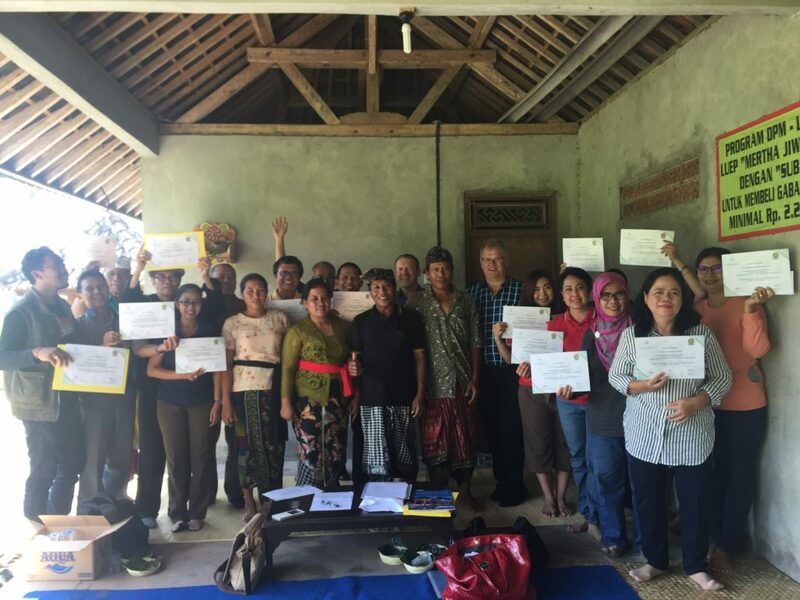 With thanks to the Crawford Fund, Dr Jay Cummins and Dr Geoff Kuehne presented an ‘impact pathways’ training course for Indonesian agricultural professionals in Denpasar, Indonesia in late July this year. The attendees were involved in a highly participatory training program that was a new experience for many of them, including a high level of interaction, small and large group activities and facilitated discussions. The highlight of the training was the opportunity for participants to apply their new skills and knowledge at an investigative field visit to a local farmer association, which provided the ideal environment to explore local farming systems constraints and how these may be overcome. The group were extremely enthusiastic and actively participated in the rapid field assessment of the operations of a local Balinese water user association (Subak) village group. . Participants were able to conduct farmer interviews to gain quality information on constraints to adoption of new practices and identify the importance of traditional cultural and religious belief systems and how these strongly influence farmer behaviour. 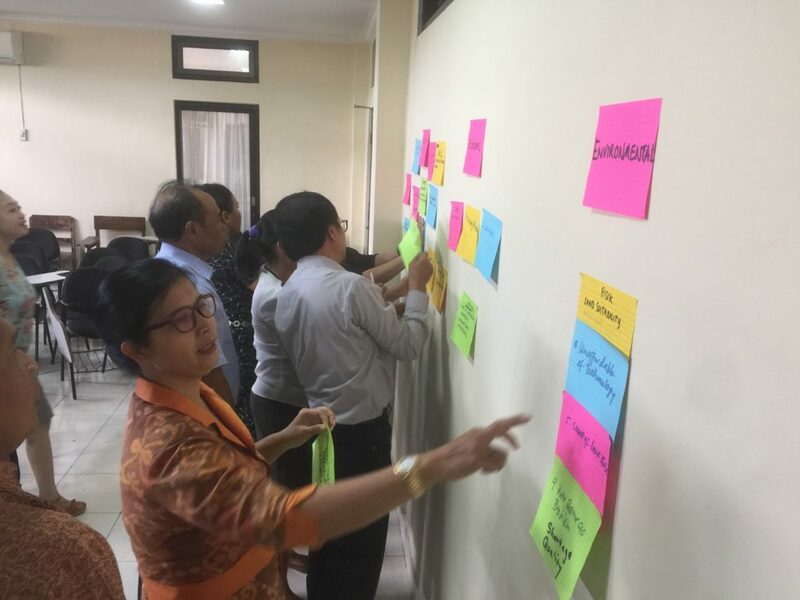 The participants passionately identified what they considered to be the major challenges and constraints facing Balinese agriculture and smallholder farmers, with particular reference to the Subak system. The constraints were then categorised as being social, economic and environmental. They were able to identify and recognise the value in linking agricultural systems constraints to designing extension related capacity building programs. “They gained a greater appreciation of the need to provide focused training programs that provide tangible outcomes in terms of the relationships between research, development and practice change”, Dr Cummins said. Feedback from the participants was very positive: “The trainers helped to provide a positive learning environment that motivated many of the participants” and “The tools learnt for the training was very practical and I will be able to apply it to my local community”. Outcomes from this training program will provide the opportunity to strengthen and build relationships between the participants engaged in the program, Udayana University and Australian researchers. “Participants, including senior academic staff through to the University Rector, now recognise the opportunities for working collaboratively in the future. The training program has been instrumental in building the relationships between all participants and the Australian trainers,” Dr Cummins concluded.